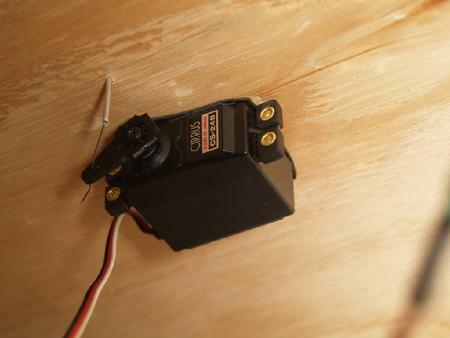 I have been using R/C servos for controlling model airplanes and small robots for some time and have always thought they would be great for using on my model railroad for switching turnouts. 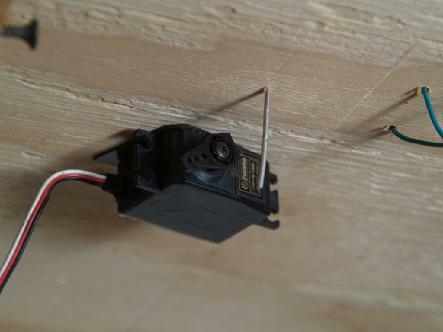 Servos are small and easy to mount and adapt to different purposes. They are thin and are ideal for multi-deck turnouts where tortoises will be too thick for the thin upper deck. They have a lot of power for their size and are quite inexpensive - about $10 for the basic servos, which are more than adequate for this purpose. 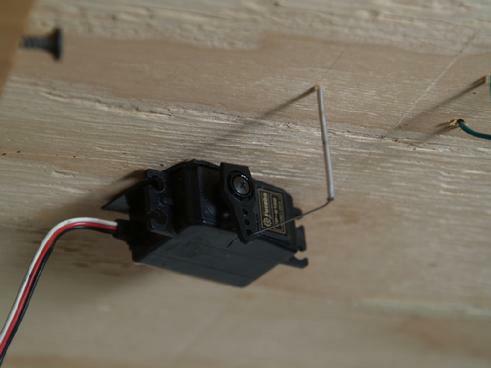 You can get much more expensive servos but the extra features are just not needed for moving a pair of points back and forth 1/8 of an inch. The downside of servos, and the reason I think they haven't been used more, is that they are controlled by an unusual method of variable pulse-widths, whereas stall motors can be controlled by a simple switch. However, for DCC this difference basically goes away as the microprocessor used to decode DCC signals an easily generate the timing needed for controlling the servo. So i set out to design and build a stationary decoder for driving servos. The microprocessor I use at the heart of this design costs $3.95 and can drive four servos with ease. Considering that a single toggle switch can set you back $3.95 these days, it doesn't seem like cost is the issue, but complexity and the barrier of electronics and programming the microcontroller. By describing how I did this I hope I can get you to try and use a servo to control some of your turnouts. While I built this circuit with DCC in mind, it will work for DC layouts as well by providing power from the ACC terminals of your power pack. 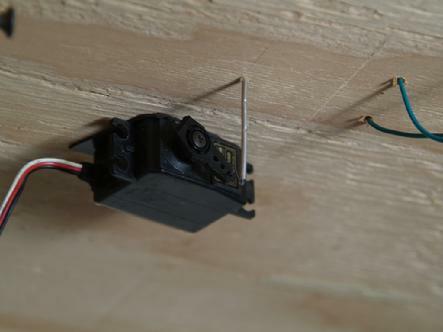 I have used 2 different methods for mounting the servos. 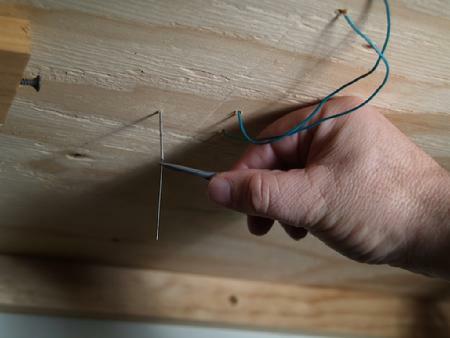 One requires planning ahead and drilling a hole under the points - just like in mounting a tortoise, and the other uses a 1/16" hole that you can drill after the turnouts are down that I use for powering turnouts that are already laid. 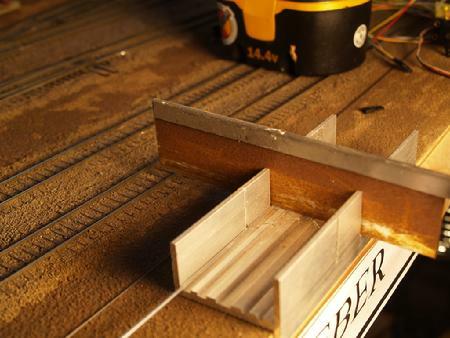 You will need to cut a piece of 1/16" aluminum or brass tubing that will be about 1/2" longer than the thickness of the roadbed plus the subroadbed. I use a razor saw to do this as in the photo. 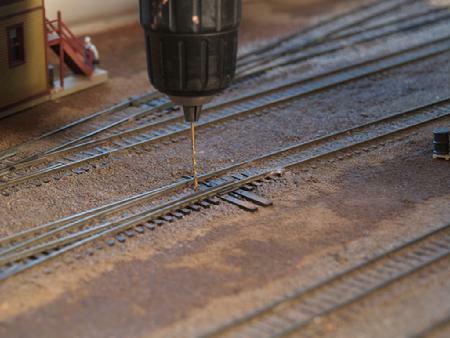 You could also use a cutoff tool in a Dremel also. 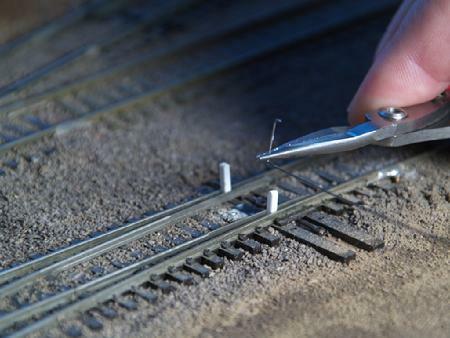 Diagonal pliers won't work as they will crush the tubing. My razor saw is about 20 years old but it still cuts even though it looks pretty grotty. You may need to file the ends to remove the flash after cutting. 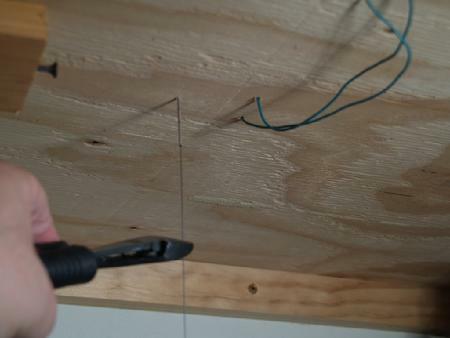 Next you drill a 1/16" hole to push the tubing through. Drill the hole between the ties about 3/8" from the tie bar. In HO this means skipping over one tie. Run the drill up and down the hole after punching through to make sure the hole is large enough to push the tube through. Gently push the tubing through the hole. The tubing is easy to bend. If you bend it while pushing it through just biend it back. 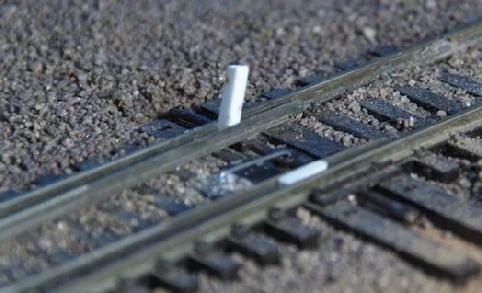 Use a blob of white glue on the side of the tubing to hold it in place. 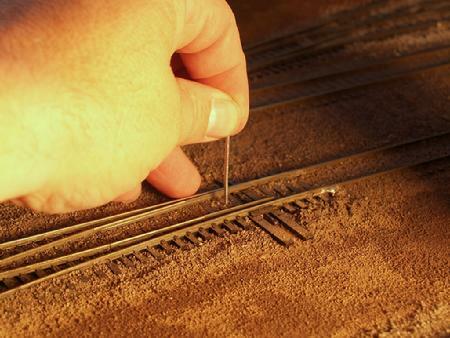 Be careful to not get the glue in the hole, although if you do you can clean it out with a piece of wire.Also be sure not to get glue on the points or the tie bar so that you don't glue the switch shut. I don't like to use super glue for this as the there is too great a danger that it will accidentally glue the points shut. 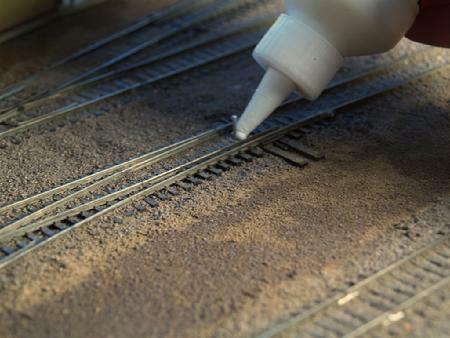 With white glue you can always clean it off with some water. Block the points so that they are in the middle of the throw with some bits of styrene or wood. This makes it a lot easier to align the servo properly by also placing the servo at the center of its throw before attaching it. Bend your .020" wire so that it is in the shape of an L with a lip that is long enough to catch the tie bar hole but not so long as to stick through and catch the roadbed underneath the tie bar. 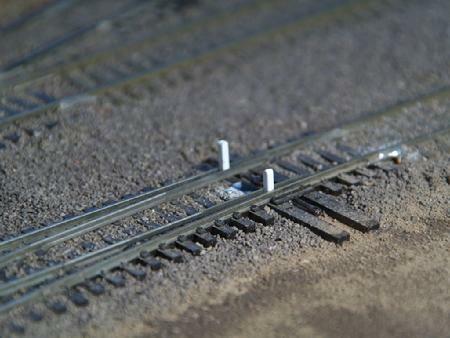 The bend needs to be at the right length between the tube and the tie bar. This is the trickiest bit of the installation. However, wire is cheap so don't worry if it takes a couple of tries to get it right. The wire should look like this when t is in place. I like to put the wire going forward from the tie bar as prototype switches of ten have a metal bar in this position so it looks sort-of-prototypical this way. Painting the rod grimy black will also help make it look more realistic.I left it shiny so it would show up better in the photos, but painting is highly recommended. Cut off the wire on the bottom such that there is 1.25" beyond the bottom of the tubing. It is better to have it a bit too long as you can always bend the excess or cut it off. If it is too short though you may have to start over with another piece. Bend the wire back 90 degrees. You can bend it any direction. If there are some framework in the way you can bend the wire in whatever direction needed to get a free mounting area for the servo. Those green wires in the photo are feeder wires they aren't part of this installation so just ignore them. The easiest way to attache the servo the bottom of the subroadbed is to use double-sided foam tape. 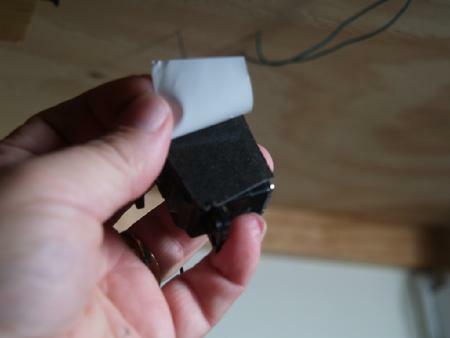 The hobby store sells "servo tape" which is stickier than the foam tape in the hardware stores. 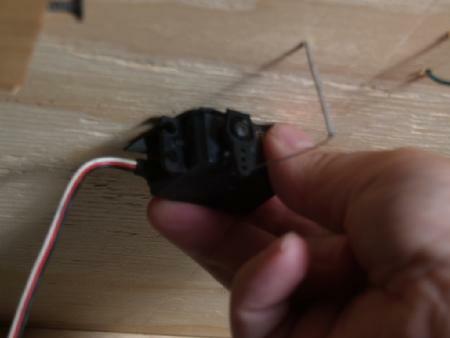 Before attaching the servo to the layout bottom, clean the area with some masking tape - stick the tape to the surface and peel it off several times to remove any loose surface materials. This will let the servo tape form a tighter bond. Now attach the servo. First center the servo in the center of it travel. Move the control horn so that it sticks straight down when centered. To do this you remove the screw holding the horn on, pull the horn off and put it back on in the correct position and re-seat the screw. Push the servo over the wire so that 3/8" of an inch sticks out the back and then seat the servo. Bend the wire at the back of the horn down about 15 degrees to help it stay in the hole. You can gently move the horn back and forth at this point to see if the wire stays in at the endpoints. If not you need to move the servo forward. 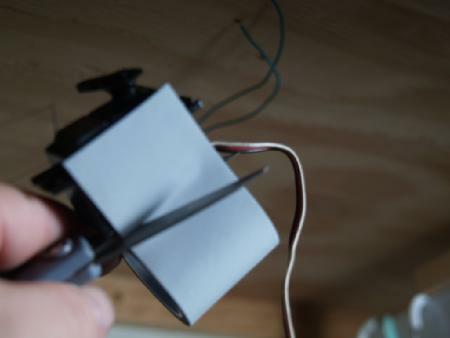 If you move the servo more than a couple of times, you will need to put more tape on. When you are happy with the servo positioning, push it tightly against the subroadbed to seat it and stick the tape firmly. 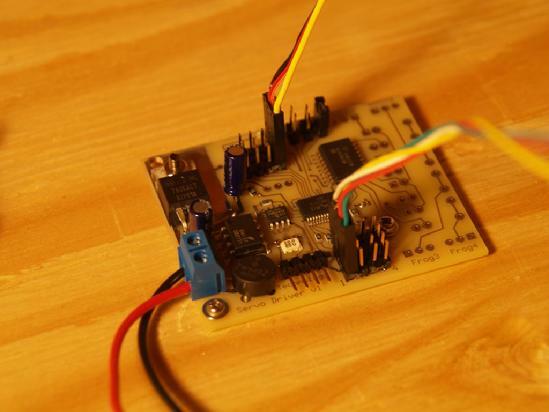 You can buy several DCC decoders for controlling servos, however, I made my own. I based mine on a an SX28 microprocessor from Parallax. These chips can be programmed in Basic with a free compiler distributed by Parallax. All the other parts are commonly available and I got mine from Digi-Key, my favorite electronics supplier. The PC board I had made at PCB Express. I had to make a bunch at once to make it economical and I can sell you one if you want to try making your own decoder. Email at dmcree at san.rr.com if you are interested. Below you can find my schematic and a link to the SX/B file to program the SX xhip. An SX/B file of the source can be uploaded here.